Thisilyn Digestive Cleanse / 90 Vcaps - Nature's Way®. 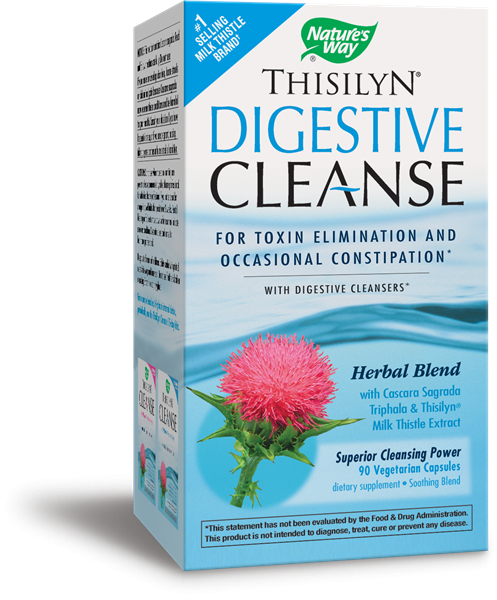 Thisilyn® Digestive Cleanse promotes liver bile production. * Bile carries toxins to the intestine, where they are eliminated through the bowels. Adults and children age 12 years and over: take 2 to 3 capsules at bedtime with a full glass (8 ounces) of water. Do not take more than 2 to 3 capsules in a 24-hour period. Not recommended for children under 12 years of age. Do not take for more than 10 days as frequent or prolonged use may result in dependence. Do not exceed recommended dosage. Not for long term use. Caution: Do not use when nausea or vomiting are present unless recommended by a healthcare professional. Consult a healthcare professional if you notice a sudden change in bowel habits that persist over 2 weeks. Rectal bleeding or failure to move bowels after use may indicate a serious condition. Discontinue use and consult a healthcare professional. NOTICE: This product contains Cascara sagrada. Read and follow directions carefully. Do not use if you have or develop diarrhea, loose stools or abdominal pain because Cascara sagrada may worsen these conditions and be harmful to your health. Consult your physician if you have frequent diarrhea, or if you are pregnant, nursing, taking any medications or have a medical condition.